Autonomous ships are set to transform the way international shipping operates in the years to come, but that’s been the headline for almost half a decade. Automation is expected to improve efficiency, both in time and carbon emissions, and help reduce to overhead costs. Contrary to the anxieties of critics, autonomous shipping could make transportation safer, too — between 75% and 96% of maritime-related accidents are caused by human error, according to Allianz. We’re beginning to see prototype navigation systems from startups and legacy companies alike. The technology will certainly transform an industry that operates in many of the same ways it did in the 1970s, but when will we start to see the impacts of these new technologies? In recent months, several successful tests on autonomous ocean craft have shown observers in the industry how close the technology has come. When it comes to autonomous ship technology, what’s possible now, what’s not, and what will be soon? Autonomous ships are already here in some capacity; marquee projects have passed major tests late this year, with small scale adoption right around the corner. Rolls-Royce Marine started the year by successfully testing its Rolls-Royce Ship Intelligence technology. Installed on a 53 meter long ferry, the software autonomously navigated from Parainen to Nauvo in the waters around Finland, then returned to port while remotely monitored from a command center 30 miles away. The company projects that autonomous ships will be a common sight by 2030. Elsewhere in Scandinavia, the YARA Birkeland, an autonomous zero-emission container vessel developed by Kongsberg and Yara, is slated to commence its remote-led operation in 2019. If all goes according to plan, this carbon-neutral electric vessel will begin fully autonomous marine transport operations next year. The ship will operate on a sea route between three ports in southern Norway, regularly transporting up to 120 twenty-foot container unit (TEU) capacities. Other startups are looking to get in on the action as well. Immense amounts of capital are pouring into the industry. One such endeavor, the Sea Machines team in Boston, received $10 million in December in new investment to refine their perception and situational awareness technology. Companies aren’t just testing systems on the open water either. The Sunflower ferry used in Rolls-Royce’s system test plies some of the most congested waterways in the world. YARA Birkeland is servicing three ports in Norway on a partial basis already. Unlike driverless cars, the technology is largely in place for automated shipping on a small scale. Regulation is a sobering fact that automation enthusiasts face in every industry. International shipping laws and maritime conventions will likely slow the adoption of automated shipping technology once it’s fully tested and ready. Key international regulations were drafted under the assumption that there is always a crew on board, and many legal bodies aren’t comfortable with allowing 400-meter-long container ships to sail around unmanned. Building consensus among legal bodies around the world will take time. Maersk fell victim to a cyberattack in 2017 that reportedly cost the company between $250-300 million. 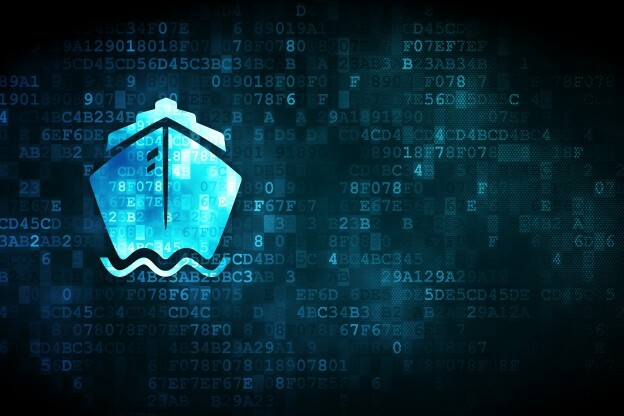 While autonomous technology for ships already exists and early trials are promising, companies will need to prove their cybersecurity prowess to client companies and regulators alike before any widespread implementation occurs. In the short term, we may still be several years away from seeing any consistent adoption of unmanned autonomous shipping. That’s not to say that implementation won’t get started regionally. Some legal experts argue that Scandinavia will get an edge on adoption first. Denmark, Norway, and Finland can change domestic regulations for domestic waterways without waiting for international consensus. Similarly, countries such as Singapore and China may be able to take a similar approach to fast tracking new technology. Until then, container ships will start implementing technology to support bridge personnel and provide an advanced understanding of a ship’s surroundings. Most shipping companies will likely reduce on-board crew for many trips as well, especially short distance routes. A lot of innovation is needed on the port-side to accommodate future automated shipping technology. In most cases, loading, unloading, and potentially drayage will also be performed automatically via autonomous cranes and related equipment. Ports around the world are striving to be ready when shipping technology is finally in place. Companies at the port will need to update their software architecture to keep up. A recent report by the British Ports Association encourage UK ports to start preparing port operations for the adoption of autonomous shipping. Meanwhile, the city of Caofeidan in Northern China aims to become the world’s first fully autonomous port by the end of the year. Caofeidan is replacing terminal trucking with 20 self-driving vehicles designed by TuSimple, a US-Chinese logistics start up. The trucks are designed to coordinate with automatic cranes that will transport intermodal containers from the ship to transport. Investments made at the port to automate and streamline loading and unloading could usher in a new wave of intermodality. Furthermore, data collected from container ships, crane systems, and rail freighters could provide valuable insight into logistics and operations all along the supply chain. Automation, big data, and intermodality are buzzy words in the industry for good reason. In time, ports around the world may be home to fleets of autonomous ships, and intermodality might expand to include driverless trucks and drone delivery fleets as well. For 3PL professionals, keeping abreast of new developments will help them tell fact from fiction and prepare their operations accordingly. Looking for a 3PL partner at the port of Los Angeles?